There are car crashes… and then there’s this. 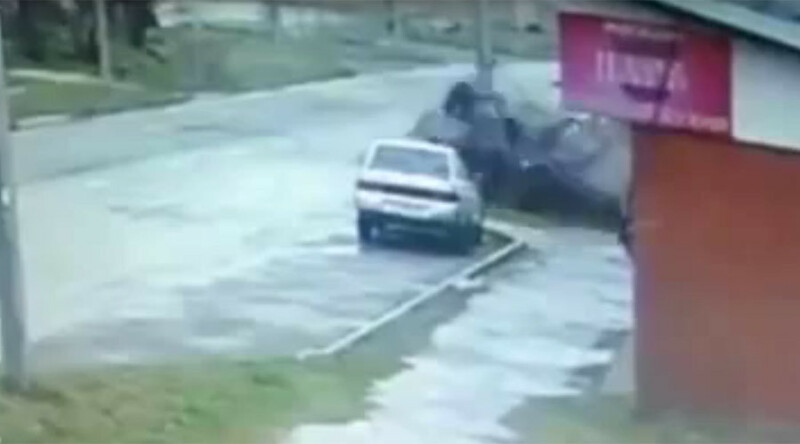 Two men were violently ejected from their car in North Ossetia, Russia, after losing control on a wet road. The car skidded on the slippery surface, smashing into a lamppost and blowing into smithereens. The dramatic accident, which reportedly took place on Sunday, was captured on camera and the footage shows one of the men kneeling stunned on the roadway in the immediate aftermath of the smash. Unbelievably, the driver and his passenger, identified as 22-year-old A. Tagiyev and 20-year-old Bakaev S., not only survived the crash but refused hospitalization, according to Russian news site LifeNews.ru.